Interstate 405 (I-405), also known as the San Diego Freeway is a major north–south Interstate Highway in Southern California. It is a bypass auxiliary route of Interstate 5 (similar to I-215 bypassing I-15 in the Inland Empire and SR 85 bypassing U.S. 101 in Silicon Valley), running along the southern and western parts of the Greater Los Angeles urban area from Irvine in the south to near San Fernando in the north. The entire route is known as the northern segment of the San Diego Freeway, and passes the Los Angeles International Airport (LAX). The 405 is a heavily traveled thoroughfare by both commuters and by freight haulers along its entire length and is the busiest and most congested freeway in the United States. The freeway's annual average daily traffic between exits 21 and 22 in Seal Beach reached 374,000 in 2008, making it the highest count in the nation. It has played a crucial role in the development of dozens of cities and suburbs along its route through Los Angeles and Orange counties. Interstate 405 begins at the El Toro Y interchange with Interstate 5 in southeastern Irvine. It then runs northwest through Orange County to Long Beach in Los Angeles County. The freeway then roughly follows the outline of the Pacific coast, varying between five and ten miles (16 km) inland before crossing over the Sepulveda Pass in the Santa Monica Mountains. I-405 then travels through the San Fernando Valley, before its termination with I-5 in the Mission Hills district of Los Angeles. Large portions of the route closely parallel Sepulveda Boulevard. The freeway's congestion problems are legendary, leading to jokes that the road was numbered 405 because traffic moves at "four or five" miles per hour, or because drivers had spent "four or five" hours to travel anywhere. Indeed, average speeds as low as 5 mph are routinely recorded during morning and afternoon commutes, and its interchanges with the Ventura Freeway (U.S. Route 101) and with the Santa Monica Freeway (Interstate 10) each consistently rank among the five most congested freeway interchanges in the United States. As a result of these congestion problems, delays passing through the entire Los Angeles metropolitan area using this bypass route instead of merely using the primary route I-5 through Downtown may be present. Of the major reasons for the excessively heavy traffic on the freeway, I-405 is the only major north–south freeway in the densely populated areas between West Los Angeles and Downtown, crossing the Santa Monica Mountains and connecting San Fernando Valley and the Los Angeles basin. Another parallel freeway is proposed to connect the Valley and the LA basin (the Laurel Canyon Freeway or La Cienega Freeway), but has faced upper class home-owner opposition. Despite 4 years of construction disruptions, billions of dollars of public money, LA Times commentary claims traffic with the lane expansions is actually just as bad or worse. I-405 is part of the California Freeway and Expressway System, and is part of the National Highway System, a network of highways that are considered essential to the country's economy, defense, and mobility by the Federal Highway Administration. The freeway from present-day I-10 to I-5 near San Fernando is known as the San Diego Freeway, and less commonly as the Sepulveda Freeway (after Sepulveda Boulevard). There are a number of points of interest that I-405 passes by or connects to. For transportation, these include (in the order passed from south to north) John Wayne Airport in Orange County, Long Beach Municipal Airport and Los Angeles International Airport. With connections, it is also very close to the Port of Long Beach, the Port of Los Angeles and Burbank Airport. Some of the educational institutions it passes include the California state universities at Dominguez Hills, Long Beach, and Northridge; the University of California at Irvine and UCLA, Loyola Marymount University, and Pepperdine University's West LA and Irvine campuses. I-405 also passes cultural facilities such as the Getty Center, the Skirball Cultural Center and the Segerstrom Center for the Arts. In addition, several shopping malls such as Sherman Oaks Galleria, Westfield Culver City, The Promenade at Howard Hughes Center, Westminster Mall, South Coast Plaza and the Irvine Spectrum Center are located along I-405. The route also passes by or through many recreation and commercial destinations. These include more than ten California state beaches, several other beaches owned by counties and municipalities, many of the beach cities favored by tourists, as well as Century City and Marina del Rey. The view from the Getty Center, south of the Sepulveda Pass, looking east, south, and west. The San Diego Freeway can be seen at the center. 1955 map of the planned Interstates in the Los Angeles area. Present-day I-405 roughly corresponds to the 1955 proposed route through the western regions of the area. I-405 was approved as a chargeable interstate (in other words, an interstate financed with federal funds) in 1955. 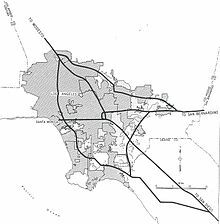 Construction began in 1957 with the first section, mostly north of LAX Airport being completed in 1961 (signed as SR 7) followed by sections west of Interstate 605 within the following few years. The highway was renumbered to Interstate 405 during the 1964 renumbering. The final section covering most of Orange County opened in 1969. Construction required the already existing Mulholland Highway to be re-routed 1.1 miles to the south along a new 579-foot-long bridge, the Mulholland Drive Bridge, to span Interstate 405. A section of I-405 was closed over the weekend of Friday, July 15, 2011 as part of the Sepulveda Pass Improvements Project. Before the closing, local radio DJs and television newscasts referred to it as "Carmageddon" and "Carpocalypse", parodying the notion of Armageddon and the Apocalypse, since it was anticipated that the closure would severely impact traffic. In reality, traffic was lighter than normal across a wide area. California Department of Transportation reported that fewer vehicles used the roads than usual, and those who did travel by road arrived more quickly than on a normal weekend. The Metrolink commuter train system recorded its highest-ever weekend ridership since it began operating in 1991. Ridership was 50% higher than the same weekend in 2010, and 10% higher than the previous weekend ridership record, which occurred during the U2 360° Tour in June 2011. In response to jetBlue Airlines' offer of special flights between Bob Hope Airport in Burbank and Long Beach Airport, a distance of only 29 mi (47 km), for $4, a group of cyclists did the same journey in one and a half hours, compared to two and a half hours by plane (including a drive to the airport from West Hollywood 90 minutes in advance of the flight and travel time to the end destination). There was also some debate about whether the Los Angeles area could benefit from car-free weekends regularly. The Los Angeles County Metropolitan Transportation Authority had full closure of a 10-mile stretch of I-405 on the weekend of September 29–30, 2012, while construction crews worked to demolish a portion of the Mulholland Bridge. Researchers at the University of California, Los Angeles used the closure of I-405 to study particulate matter air pollution. The researchers took air samples before, during, and after the closure. The researchers found an 83% reduction in ultrafine particles, 55% reduction in fine particle matter, and 62% less black carbon. The $1 billion Sepulveda Pass Improvements Project added a high-occupancy vehicle lane and associated changes to freeway entrances, exits, and underpasses along a 10-mile stretch through the Sepulveda Pass between I-10 and U.S. 101/Ventura Boulevard. The project was completed as a design-build in contrast to the traditional design-bid-build used typically in infrastructure improvement. This section of I-405 was closed for a weekend in mid-July 2011 to demolish the Mulholland Drive Bridge, and a 10-mile section was closed for the last weekend of September 2012 (See 'Carmageddon 2011' and 'Carmageddon 2012' above). Jamzilla was the name for the I-405 closure on President's Day Weekend 2014. There were lane closures and complete closures on I-405 starting February 14 at 10 p.m. until February 18 at 6 a.m. to pave and re-stripe the northbound lanes. On May 23, 2014, the 10-mile high-occupancy vehicle lane was opened to traffic. Aerial view from the north of Interstate 405's interchange with Interstate 105 near Los Angeles International Airport. The photo is from directly above Arbor Vitae Street. The hills of the Palos Verdes Peninsula are visible in the distance. Proposed changes between the Manchester and Century Boulevard interchanges in the City of Inglewood to provide a new southbound on-ramp and a new northbound off-ramp for Arbor Vitae Street, to reconstruct and widened the Arbor Vitae Street over-bridge and replace the Century Boulevard overcrossing structure. This work would reduce congestion on the approach to Los Angeles International Airport. The California Department of Transportation has not yet issued a start date for this work. The Orange County Transportation Authority is currently preparing the design plans to add a HOT express lane and one mixed flow lane in each direction between Highway 73 in Costa Mesa and I-605 in Seal Beach. The I-405 Improvement Project is starting construction in 2018 and is scheduled to be completed in 2023. Following the 1966 UCLA–USC rivalry game, USC was voted into the Rose Bowl despite the UCLA team's having defeated the Trojans—with both teams having only one loss during the season. UCLA students protested by blocking the freeway's northbound lanes at Wilshire Boulevard. While dangerous high-speed chases along the San Diego Freeway are not uncommon, perhaps the most famous chase in its history was also one of the slowest. On the afternoon of June 17, 1994, former football star O.J. Simpson, who was accused of murdering his ex-wife Nicole Brown Simpson and waiter Ronald Goldman, took to the freeway in a white Ford Bronco (driven by former USC teammate Al Cowlings) with police in pursuit. A bizarre, widely televised low-speed chase ensued and ended hours later when Simpson returned to his Brentwood estate via the Sunset Boulevard exit and surrendered to law enforcement. Ennis Cosby, the only son of Bill Cosby, was murdered along I-405 in Los Angeles on January 16, 1997, while fixing a flat tire. On March 10, 2019, the portion of I-405 between the Ventura Freeway (US 101) and Burbank Boulevard in the Sherman Oaks area was closed in both directions as a propane tanker truck carrying more than 9,000 US gallons (34,000 l) of flammable gas overturned along the southbound lanes of I-405. No explosion resulted from the incident. I-405 was the location for the short film 405. The Swedish rock band Europe's song "California 405" is featured on their 2015 studio album War of Kings. Chuck Lorre used an end-of-show vanity card in 2013 to berate workers on the 405 for their apparent lack of progress after five years. The Death Cab for Cutie song "405" on their second studio album, We Have the Facts and We're Voting Yes, may be incorrectly associated with California's I-405. The song is actually referring to I-405 in Seattle, as the band is from Bellingham. The song "Drive" on Halsey's 2015 album Badlands uses the story of a reckless drive on the I-405 to frame its relatively unstructured lyrics. 18 Bolsa Avenue / Goldenwest Street Goldenwest Street is signed as Golden West Street. 21 SR 22 east (Garden Grove Freeway) / Valley View Street / Bolsa Chica Road / Garden Grove Boulevard – Garden Grove Southern end of SR 22 concurrency, signage omits Bolsa Chica Road. 35 Avalon Boulevard – Carson Northbound exit to Avalon Boulevard south is via exit 34. 45B Imperial Highway Southbound exit is part of exit 46. 47 Manchester Boulevard / La Cienega Boulevard / Florence Avenue Manchester Boulevard was former SR 42. ^ "Most Travelled Urban Highways Average Annual Daily Traffic". Fhwa.dot.gov. July 27, 2010. Retrieved January 26, 2013. ^ "Crossroads of Confusion". Los Angeles Times. March 20, 1998. p. 2. Retrieved October 11, 2012. ^ California Department of Transportation; California State Transportation Agency (January 2015). 2014 Named Freeways, Highways, Structures and Other Appurtenances in California. Sacramento: California Department of Transportation. pp. 82, 266. Archived from the original (PDF) on May 30, 2015. Retrieved May 30, 2015. ^ Racine, Ned (January 11, 2011). "How the Mulholland Drive bridge was constructed". Los Angeles County Metropolitan Transportation Authority. Retrieved July 16, 2011. ^ a b "Interstate 405: The 'Carmageddon', History, Myth and Trivia". During 53 hours of closure, the north side of the Mulholland Bridge will be demolished as part of the $1 billion Sepulveda Pass Improvements Project. ^ Judy Gish Issue Date: 06/2011. "Inside Seven – Caltrans, District 7 – Monthly Newsletter". Dot.ca.gov. Retrieved January 26, 2013. ^ Gostar, Reza (June 9, 2011). "Carpocalypse: The Weekend the 405 Freeway Will Stand Still – Brentwood, California Patch". Brentwood.patch.com. Retrieved January 26, 2013. ^ a b Mather, Kate; Bloomekatz, Ari; Saillant, Saillant (July 19, 2011). "In 'Carmageddon,' some see road map for the future". Los Angeles Times. Retrieved August 1, 2011. ^ "Metrolink sets weekend ridership recording during 405 closure". The Source. Retrieved July 21, 2011. ^ "JetBlue — 405 Freeway Closure? We're So Over It!". JetBlue. Retrieved January 26, 2013. ^ "Great Circle Mapper". Gcmap.com. Retrieved January 26, 2013. ^ "LA avoids feared 'Carmageddon' traffic jam". The Independent. July 17, 2011. Retrieved July 17, 2011. ^ Morgan, Jared (July 19, 2012). "Carmageddon 2012 Announced, Full 405 Closure in September". Retrieved September 4, 2012. ^ Winer, Arthur; Zhu, Yifang; Paulson, Suzanne (Spring 2014). "Carmageddon or Carmaheaven? Air Quality Results of a Freeway Closure" (PDF). Access. 44: 17–21. ^ "Sepulveda Pass Improvement Project". Los Angeles County Metropolitan Transportation Authority. Retrieved July 15, 2011. ^ Groves, Martha (February 14, 2014). "Jamzilla lane closures on the 405 Freeway begin tonight". Los Angeles Times. Retrieved October 4, 2014. ^ "Carpool lane on North 405 Freeway opens". KABC-TV Los Angeles. May 23, 2014. Retrieved May 23, 2014. ^ "405 on the move-PR" (PDF). ^ "OCTA approves study of 405 widening project". Daily Pilot. February 10, 2010. Retrieved July 16, 2011. ^ Hernandez, Jade (March 10, 2019). "405 Freeway closed in Sherman Oaks after tanker carrying 9,400 gallons of propane overturns". ABC7.com. KABC-TV. Retrieved March 10, 2019. ^ "CLP – Vanity Card #429". Retrieved October 4, 2014. ^ Sherman, Maria (August 21, 2015). "Halsey Shares Unrestrained New 'Badlands' Song, "Drive"". Fuse. Retrieved December 17, 2017. ^ "405 Freeway NB Montana Avenue Offramp Dies At 57". CBS. Los Angeles, California: CBS Radio Inc. November 24, 2013. Retrieved March 19, 2014. Wikimedia Commons has media related to Interstate 405 (California). This page was last edited on 29 March 2019, at 18:52 (UTC).